If you have not recently rejuvenated your SMB’s cover image, you are lulling the potential in your business’ performance. Increase your SMB’s bottom line performance by increasing your Facebook likes. 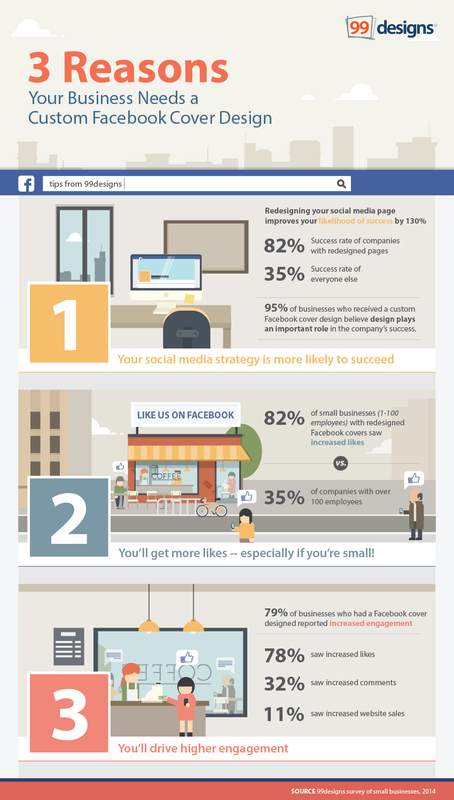 According to Inside Facebook’s Justin Lafferty, in Infographic: 3 reasons why SMBs need a custom Facebook cover photo (October 8, 2104), 82 percent of SMB owners experienced a swell in Facebook likes after recreating their cover image. The research data below has emphasizes the importance of a Facebook infographic facelift in order for you to reach optimal marketing potential via social media. Facebook vs Twitter : Which is better for your business?